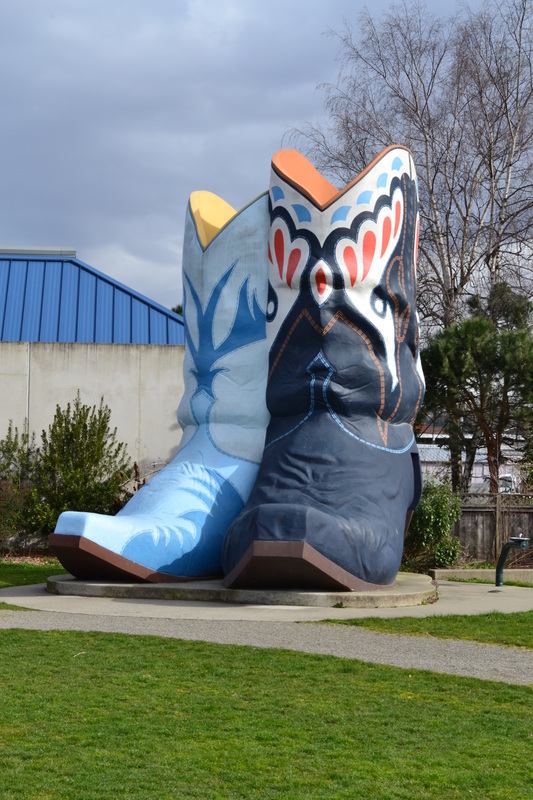 Hat n’ Boots was built by a sculptor named Lewis Nasmyth for what was originally supposed to be part of a planned Western-themed development known as the Frontier Village Shopping Complex in the Georgetown neighborhood of Seattle. When the developer ran out of money, they were left with the giant sculptures outside of a western-themed gas station called Premium Tex. The hat sat over the building and the boots were the doors for the bathrooms. The early years were good for this premium roadside attraction. At one point, the fuel station was selling more gasoline than anywhere in the state. 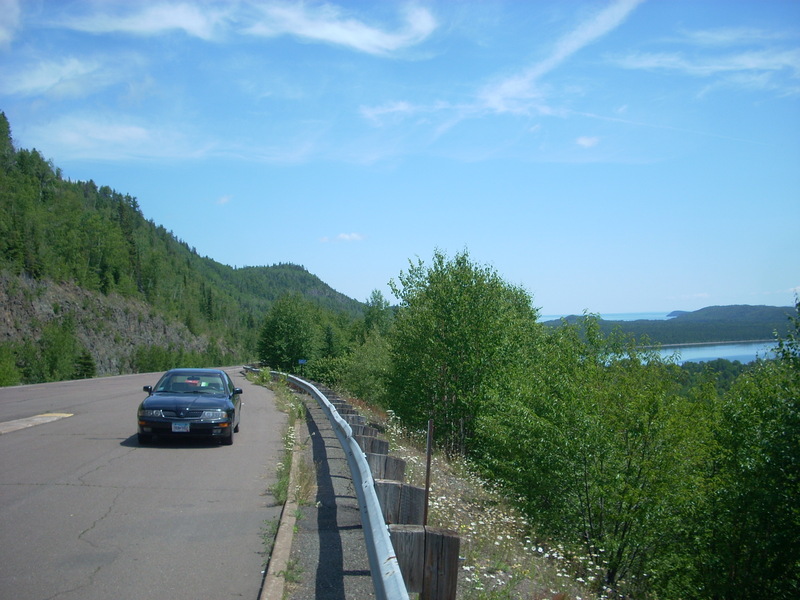 People came from miles around to see it, and there is even a rumor that Elvis Presley himself once visited. It even made it into the opening credits of National Lampoon’s Vacation. But by 1988, the Interstate system had already bypassed Georgetown and severely impacted business. The gas station was forced to close up its doors. Hat n’ Boots fell into disrepair and was vandalized heavily. It was a sad state of affairs for such an iconic attraction. In 2003, a local community council lobbied and fundraised to get this thing back to its former glory. 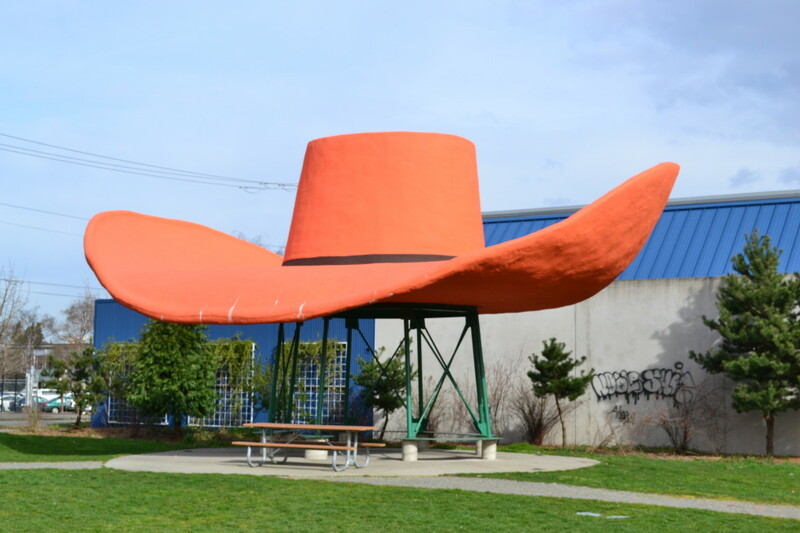 After successfully pleading thier case, it was then moved to Oxbow Park, a city park near its original location, where ‘Boots’ were refurbished in 2005, but ‘Hat’ languished as a wire skeleton until 2010. After receiving a full restoration and new paint, Hat n’ Boots now looks great, planted in Oxbow Park, where it will serve as a reminder of the optimistic spirit of roadside Americana. While in the area: Seattle has tons of amazing things to do. Space Needle, Pike Street Market, and the Fremont Troll are among the first ones to check off the list. 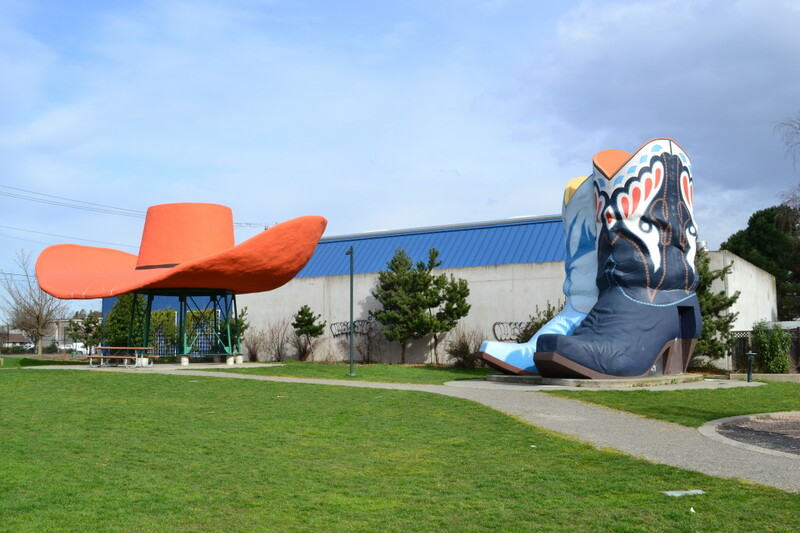 This entry was posted in Highway Highlights and tagged Roadside Attraction, Seattle, WA, World's Largest by Seth5544. Bookmark the permalink.